Verizon’s unlimited 4G Mobile Hotspot was introduced in a trial version with the HTC ThunderBolt allowing the user to tether up to 8 devices on the carrier's blazing fast LTE network and the trial was extended through June 16th to cover the Samsung DROID Charge, but come June 16th the trial feature will be disabled through a software update, according to an anonymous tipster. Currently, Big Red offers a $20 for 2GB of mobile data plan for its 3G smartphones and while our tipster didn’t know about the exact pricing of the 4G Mobile Hotspot, he quoted "a hot news and announcement" page confirming that the cost for 4G phones will not be the same. Users who wish to continue using the service will receive a message requiring them to contact their system administrator in case they want to continue using the service. We’ve heard rumors about a $29.99 price tag for unlimited use of the feature, considerably cheaper than the MiFi plans running at $50 for 5GB and $80 for 10GB. Could it be true and would you use it at such a price? Feel free to give us your two cents in the comments below. Its not a rumor PHONEARENA!!! It's already been announced. Call customer service and they will tell you. It will be 29.99 for UNLIMITED use. Yes, VZW will go into tiered pricing, but right now its all about getting people into the 4G wave. The network can handle it right now. In my opinion, this is a great move by VZW. um no you're completely wrong... the price is TBD. Its only free up until 06/15 and then afterwards the price has not be announced. It will not be unlimited. And you guys are ridiculous for even thinking it would be. Sorry brah. I cant risk losing my job over this, but I saw the memo. I didnt believe it at first so I confirmed the info with the "person" in charge. Cant get into details, but I asked if we could release the info since it wasnt a internal memo, and I was given the green light. This TBD stuff is wrong. everybody and their mom has said the same thing, but if you ask any customer service person, the memo is there to release the info. It did seem ridiculous to me also man. Thats why I took the time to confirm it. However as crazy as that sounds, if you stop and think a little, it makes sense that you would promote your network by saying "come here, no limits". Remember how even though AT&T had already taken away the unl data option for the iphone, VZW came out and said we would keep it unlimited. I am not looking for the "I told you so" glory. Im just letting phonearena know that this article is factually wrong. Period. If any other vzw rep cares to do the work and search for the info, its available in a QRG. Done with this topic. Obviously something doesnt make sense since its cheaper than buying the usb modem/ mobile hotspot for a $50/$80 5/10 gig as someone further down already mentioned. i didnt get an answer to that question, but I would say that at least you can keep the usb/hotspot at home. Cant think of many other reasons, plus if you buy a phone just for the mobile hotspot, you still gotta pay for the voice/data plans. I dunno, i wish I knew the exact reason why we are going that way. Anyone else can think of a good reason??? It's all greed and exclusivity. I can try not to complain about capitalism, but its going to sound like whining either way. $300 for new units, $$ data plans, $$ tethering plans...it's all about having it first and now. In 5 years, it'll be standard fare, but for now they can charge these outrageous sums because we'll pay them to be the 'first kid on our block' to have it. The concept is never more pervasive than with DVD/BluRay sales. Both medium cost the same to produce, but one is more desired, so it costs 3x as much. Greed is not good (despite Gordon Gekko of 'Wall Street' fame). I'm older and wiser - It's hard to justify paying $200-400 for a phone with accessories and then upwards of $2.5K over the life of a 2 year contract. $29.99 for unlimited is outrageous? Selling a phone for less than half the cost is a rip off? You're entirely missing the point. Is $29.99 for unlimited tethering outrageous? No! But it is when you're already paying $29.99 for a data plan. Is selling a phone for less than half the cost a rip off? Again No! But let's face it, no matter how much the actual phone cost no carrier or 3rd party reseller sells phones at full cost. Unless you buy it unlocked then you pay full price. Basically what Flea is saying it's not worth it to pay $300 for a phone then have to turn around and pay $30 a month for a data plan. Then if you want tethering it's another $30 a month. So with a basic (450mins) talk & txt it's $69.99 + $29.99 data plan + $29.99 tethering plan. You would be basically paying $130 a month, now add that up over a 2 year contract and it's $3,120. Not including taxes or any other monthly charges. Like VCast, ringtones, roadside asst or insurance. The 450 talk and text is $59.99. And if you don't like having to pay for the data or mobile hotspot (which is COMPLETELY optional on all of the phones) don't get a smart phone. And quit bitching. Really? I don't have to buy a smartphone? Hey chit for brains, I wasn't bitching. I was trying to explain what the original poster was saying. And way to stay on topic. Since were are talking about smartphones. It's not COMPLETELY optional for data or hotspot. A data plan is required with all smartphones and if you WANT to use hotspot you have to pay for it as well. When you pay $29.99 for an unlimited data plan for in-phone, they are estimating the amount of data you can use on it to set the price. When you allow hotspots, suddenly you can have up to 8 devices connected to that same "pipe", and thus the amount of consumption will go up (on average). For example, how many Steam games can you use when doing in-phone data only? How many large Windows 7 patches do you download for your laptop when on the road for work? How do the size of app downloads compare to laptop (or desktop) compare to the android market apps? Are you one of the few phones that does netflix - if not, that tethering will boost usage. (I tethered that on a vacation and in less than a week hit 4 GB of usage with movies/TV alone.) In other words, you have an estimated usage that is significantly lower for the average consumer when restricting it to the phone than allowing tethering. Now, cap the data amount (say 5GB in phone only) then you have an argument - after all, I should not be charged extra for consuming data faster. Nor should I pay more for the same amount of data just because it is on a phone. ($20/GB for phone hotspots vs $10/GB for mobile broadband devices overage costs- why does the same amount of data usage cost twice as much??) So, in summary - make the data capped, then how I use it should matter. Make it unlimited, then tethering changes my behavior to consume more and thus I should pay a premium for the service. Make sense? I really like the mobile hotspot as it is in the Demo (free). It justifies the cost of the data plan. I will not pay extra for the service, it should be included in the feature of the data service. That way the competition would be beneficial to the user. This money grabbing by the companies is evil, its a shame we customers buy into this scam. @droidlova Hope you didn't get your information from this following statement from "HotNews". Seeing as the time this statement was posted and then your posting, I'd say you misread. Contacting COOS and Customer Service, they have no idea and is still TBD for pricing after free promo expires. Be awesome if it were true, but as of now there's no information or QRG on this topic. Unlimited Hotspot Offer - 4G LTE MHS/MBBC Promo posted: 5/17/2011 10:04:27 AM (ET) Verizon Wireless has extended the Limited Time promotion for Mobile Hotspot and Mobile Broadband Connect on 4G LTE (Long Term Evolution) Smartphones, ThunderBolt by HTC and DROID Charge by Samsung. The following are the Unlimited Hotspot promotion details. 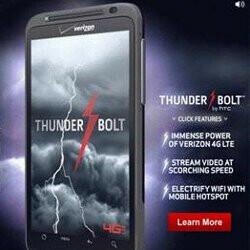 Limited Time promotion from 3/17/2011 - 6/15/2011 which allows customers unlimited 4G LTE Mobile Hotspot and Mobile Broadband Connect usage until June 15, 2011 with the purchase of a ThunderBolt by HTC or a DROID Charge by Samsung, with a voice plan and a data package $29.99 or higher. The $20/GB (Gigabyte) plan will not be available on 4G LTE Smartphones. On June 16, 2011 a software update will remove the Mobile Hotspot offer. A message will be sent to the end user to contact their system administrator to subscribe to Mobile Hotspot. i feel they should make the feature free forever, or at least lower the price for unlimited.